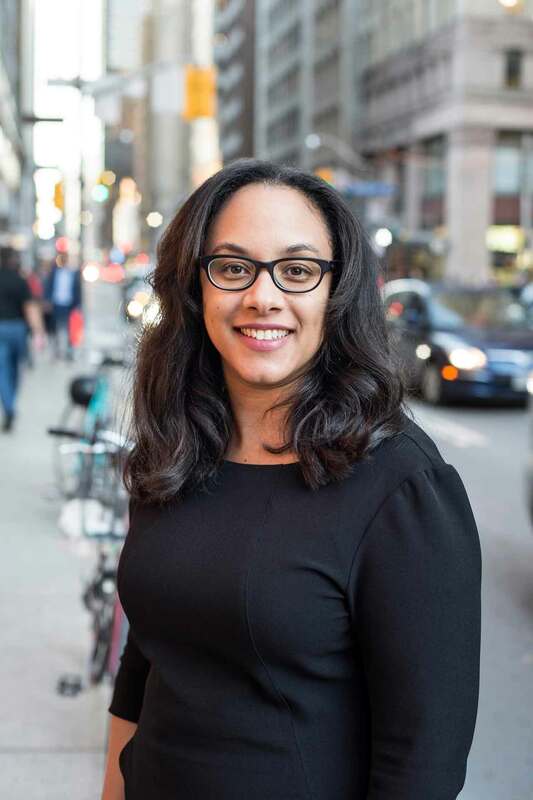 Lorraine is a lawyer and trademark agent based in Toronto who has practiced exclusively in the areas of intellectual property, privacy, social media and advertising and marketing law since 2005. She has been recognized by World Trademark Review magazine as a recommended trademark expert in Canada in the fields of litigation, enforcement, prosecution (trademark applications) and strategy. She has also been recommended by her peers to Best Lawyers ® in Canada for her expertise in intellectual property law. Assisted various Canadian mobile app clients with their Canadian and foreign intellectual property strategy. Assisted agricultural research institution with trademark applications and reviewed marketing materials to ensure appropriate trademark use. Counselled foreign insurance client on compliance with Canada’s Anti-Spam Legislation (CASL). Developed social media policies for clients in various sectors. Reviewed draft book copy for IP infringement prior to publication. Reviewed websites for compliance with Canadian advertising, marketing and IP laws. Reviewed a computer graphic user interface prior to deployment to assess possible copyright infringement. Represented various clients in copyright and trademark disputes, including those spanning multiple jurisdictions. Represented a foreign client in large scale copyright enforcement program. Advised clients on patent and trade secret protection strategy. Member, Emerging Issues Committee, Health Policy and Trademark Rights Subcommittee, January 2016 – present. Member, United States & Canada Law & Practice Subcommittee, INTA Bulletin, January 2012 – December 2015. Member, Internet Subcommittee, Internet Governance & Contractual Relationships Subcommittee, January 2010 – December 2011. Member, Security Interests Subcommittee, January 2006 – December 2009. Past Chair and Marketing Co-Chair, September 2013 – August 2014. Chapter Chair, September 2012 – August 2013. Logistics Chair, September 2011 – August 2012. Secretary, September 2010 – August 2011. Executive Member, September 2016 – present. Member, Intellectual Property Law Section. An Ounce of Prevention is Worth a Pound of Cure: Key Elements for Social Media Policies, Table Topic Presentation, 139th Annual Meeting, International Trademark Association (INTA), Barcelona, Spain, May 21, 2017. The Internet of Things and Connected Payments, Institute 2017, Ontario Bar Association, February 9, 2017 (co-chair). Intellectual Property Meets Online Marketing, 23rd Annual Advertising and Marketing Law Conference, Canadian Institute, Toronto, January 24, 2017 (panelist). Intellectual Property Litigation, Ontario Bar Association, Toronto, November 22, 2016 (co-chair). In the Trenches with Social Media, Leadership Meeting, International Trademark Association, Hollywood, Florida, USA, November 18, 2016 (panelist). Critical Strategies for Advising Start-Ups: Collaboration Between Entrepreneurs, Business and IP Counsel, Ontario Bar Association, Toronto, November 2, 2016 (panelist). Trademarks in Metatags and Keywords – A Summary of the Current State of the Law in Canada as Contrasted with the U.S. and Europe, 90th Annual Meeting, Intellectual Property Institute of Canada (IPIC), Quebec City, September 29, 2016 (panelist). Temporarily Confused: Exploring Initial Interest Confusion, Intellectual Property and the Internet, Ontario Bar Association, Toronto, June 9, 2016 (panelist). Intellectual Property and the Internet, Ontario Bar Association, Toronto, June 9, 2016 (co-chair). #Hashtags #EverythingYouNeedToKnow, International Trademark Association, 138th Annual Meeting, Orlando, USA, May 24, 2016. Pure Bologna or Pure Baloney: The Global Food Fight over Geographic Indications, 31st Annual Intellectual Property Law Conference, American Bar Association, Bethesda, USA, April 8, 2016 (moderator). Canadian Copyright Law: A Primer, Sheridan Institute of Technology and Advanced Learning, Web Design Graduate Certificate Course, Oakville, February 2016. Privacy Considerations Surrounding the Use of Beacon Technology in Marketing, The Commons Institute, January 27, 2016. Intellectual Property Meets Online Marketing, 22nd Annual Advertising and Marketing Law Conference, Canadian Institute, Toronto, January 20, 2016. Seven Principles to Follow When Contemplating Comparative Advertising in Canada, Slaw.ca, October 15, 2015. Protecting Your Intellectual Property on Social Media, Social Media and Internet Law: Your Comprehensive Guide, Ontario Bar Association, Toronto, June 11, 2015 (co-presenter). Social Media and Internet Law: Your Comprehensive Guide, Ontario Bar Association, Toronto, June 11, 2015 (co-chair). Supreme Court of Canada Recognition of Duty of Honest Contractual Performance Impacts IP License Agreements, INTA Bulletin, Vol. 70, No. 10, June 1, 2015. Brand Aid – Implementation of the Combatting Counterfeit Products Act, INTA Bulletin, Vol. 70, No. 6, March 15, 2015 (co-author). Privacy Issues: A Guidebook for Advertising Online, 21st Annual Advertising and Marketing Law Conference, Canadian Institute, Toronto, January 2015. Trademark Licensing 101: Fundamentals for Brand Monetization & Protection, Toronto Chapter, Licensing Executives Society (USA and Canada), October 30, 2014. Intellectual Property, Social Media and Internet Law – Forms and Precedents, LexisNexis, May 31, 2014 (chapter co-author). Registrations Resulting from Errors by Trade-Marks Office Cannot Be Appealed, INTA Bulletin, Vol. 69, No. 5, March 1, 2014 (co-author). Bill C-56 Poised to Make Its Mark, INTA Bulletin, Vol. 68, No. 13, July 15, 2013. Roaring into a New Era: Sound Marks Now Registrable in Canada, INTA Bulletin, Vol. 67, No. 19, November 1, 2012. Key IP Issues in Marketing & Advertising, 18th Annual Advertising and Marketing Law Conference, Canadian Institute, Toronto, January 2012. The Internet, Social Media &Trade-marks, Trademarks & Unfair Competition Course, Faculty of Law, Queen's University, March 2010. The Good, the Bad and the Ugly: Recent Canadian Bankruptcy Legislation Amendments and Their Impact on Intellectual Property Licensing, IP Osgoode Blog, January 19, 2010 (quoted in John T. Ramsay, Ramsay on Technology Transfer, Third Edition, 2013). Canada's Federal Court Rejects American Law of Fraud on the Trademark Office, Journal of Intellectual Property Law & Practice, Vol. 4, No. 10, August 2009 (co-author).